Thinking of remodeling your Sugar Land Texas kitchen? Infinite Designs has provided Kitchen Remodeling to Sugar Land homeowners since 2014. Nothing adds to pleasure and pride of home ownership like a brand new kitchen. Your kitchen is the core of your home. Infinite Designs can create a beautiful, functional kitchen that you'll enjoy working in, gathering in and entertaining in for years to come! Sugar Land Kitchen Remodeling – Within Budget! Whether you are looking for a some simple updates, such as new countertops and appliances, to modernize your kitchen, or are in the market for a full kitchen remodel, Infinite Designs delivers! Kitchen remodeling doesn't have to break the bank. Infinite Designs can work within your budget to provide the most economical yet attractive cabinets, counters and flooring. 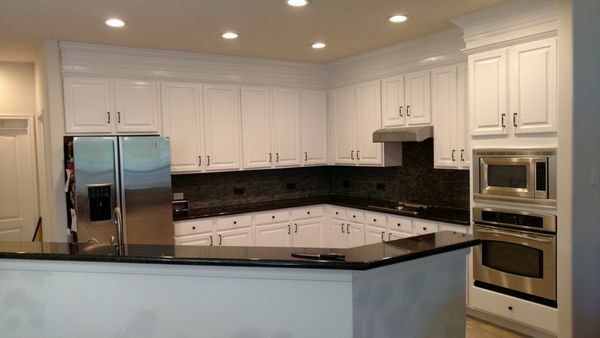 Our Sugar Land kitchen remodeling team will work within your budget to provide the kitchen improvements that you require, and a few extras that you desire. Infinite Designs can help you choose architectural styles that will blend your new kitchen with the current design and feel of adjoining rooms. Whether you are currently working with a kitchen designer or need help configuring a new kitchen space, the Sugar Land kitchen remodeling experts at Infinite Designs are experienced in working closely with customers from start to finish. We'll help you consider work space needs, while implementing a style that will create a flow from room to room within your home. Working within budget your does not mean having to corners. Infinite Designs craftsmen take great pride in remodeling Sugar Land kitchen spaces, economically, while honing in on the details. From seamless tile floor installations, to configuring a kitchen island that is tailored to your unique needs, our kitchen remodeling professionals don't miss a trick!